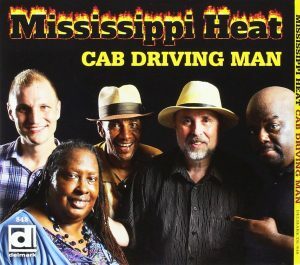 Cab Driving Man is the twelfth album by Mississippi Heat, a standard in ensemble blues since 1991. The band was founded by harp player Pierre Lacocque, and since its humble beginnings, a number of blues stalwarts have been members at one point or another. Alumni include bassist Bob Stroger, guitarists Billy Flynn, Carl Weatherby, Lurrie Bell, John Primer, pianist Barrelhouse Chuck, drummer Allen Kirk and vocalists Mary Lane and Deitra Farr. Their sixth album for Delmark Records, Cab Driving Man features a winning lineup of players: Pierre Lacocque – harmonica, Inetta Visor – vocals, Michael Dotson and Giles Corey – guitars and vocals, Dave Specter – guitar, Brian Quinn and Ricky Nelson – bass, Terrence Williams and Kenny Smith on drums. Chris “Hambone’ Cameron and Sumito Ariyo tickle the ivories, Sax Gordon plays tenor and baritone sax, and Ruben Alvarez handles percussion. As with any Mississippi Heat album, once the needle hits the groove, hold on to your hat because a seriously good time is about to ensue. There are 16 tracks of delicious, soulful blues here! Naturally, we did have our favorites though. The band steps up on “Flowers on My Tombstone,” and Visor really delivers on vocals, along with a perfect solo from Dotson on guitar. Cameron’s keyboard accents and Lacocque’s harp lines and just the right touch. Other tracks we enjoyed include “The Last Go Round,” with its quick pace, and Dotson’s guitar picking and catchy vocal, and “Rosalie,” with its spunky, Buena Vista Social Club disposition, Quinn’s punchy bass line, another delightful vocal from Visor, and Giles Corey’s engaging guitar solo. The hard driving fun of “Icy Blue” was also a turn on and had us tapping our feet; it’s just such a well written, well performed piece of music. Bravo y’all! Cab Driving Man brings a veritable blues smorgasbord to your ears. From Cotton Club Cab Calloway blues to the blues of NOLA party dens, boogie-woogie to Cajun, this album has it all. There’s even hat tips to Robert Nighthawk and Robert Lockwood Jr. There are no wooden nickels here. This is the genuine article. This band is so tight, they could bind up a charging lion with the web of a spider. Pick up your copy today!